As a historian interested in visuality in general and Soviet visual culture in particular, I read Jan Plamper’s book with great interest and benefit, but with some perplexity. The book offers us an excellent survey of the production of some of the visual components of the Stalin personality cult and an interpretation of some of those products. The chapter on photos of Stalin in Pravda gave me an almost palpable sense of the progression of the cult over time. The chapters devoted to the artists and institutions that produced the Stalin cult contribute an important case study to a developing body of scholarship about socialist realism in the visual realm. Its discussion of those products and of socialist realism as a system of artistic production, however, left me unsatisfied. I am not trained as an art historian so I want to be careful about making definitive statements here, but I found several of the arguments in the book to have been suggestive but under-developed. First, I have no doubt that Stalin was understood to be the central point of concentric circles radiating out from his body, his office in the Kremlin, and so on to the borders of the empire, as Plamper argues, but I struggled in vain to see anything circular in the composition and conceptualization of the paintings he singles out for analysis. Both Morning of the Motherland and Stalin and Voroshilov in the Kremlin look to me to be constructed of networks of diagonal lines, making up numerous independent and overlapping triangles. Morning certainly does place Stalin’s heart in the sun’s spotlight at the center of the painting, but the plows, plow lines, power lines and road all converge at a vanishing point behind Stalin, forming triangles on the horizontal plane of the landscape and a vertical triangle from the right and left edges of the canvas up to Stalin’s head as the apex. The smokestacks in the distance may be on a circular line, as Plamper suggests, but it’s hard for me to see that and it’s more plausible to my eye to see them as another flat line along the horizon making up the base of another triangle with Stalin’s head as the apex again. Stalin and Voroshilov is even more insistently angular, with diagonals crisscrossing throughout the composition, creating a sense of dynamism underlying the solidity of Stalin’s immobile form (he seems to be both standing still and walking at the same time, a neat trick!) and among the solid, stable architectural elements. One can easily imagine the conceptual circles Plamper proposes, but I can’t see them anywhere in these two paintings. A lot rests on Plamper’s geometrical argument so this discussion of composition is not solely formal. As geometric forms, as conventions of modern painting, and as semiotic categories, circles and triangles have very different implications and resonances. Circles are historically and conventionally signs of completeness and enclosure. Here, circles are one of the totalizing visual strategies of the Stalin cult. And it’s not hard to imagine the enclosure of all nature, the whole empire, and the entire population in Stalin’s embrace; everything and everyone functioning within Stalin’s orbit. But diagonal lines are considered dynamic, open forms; triangles are powerful wedges, and because the criss-crossing diagonals don’t necessarily enclose space as fully formed triangles, they can be divisive and exclusive. 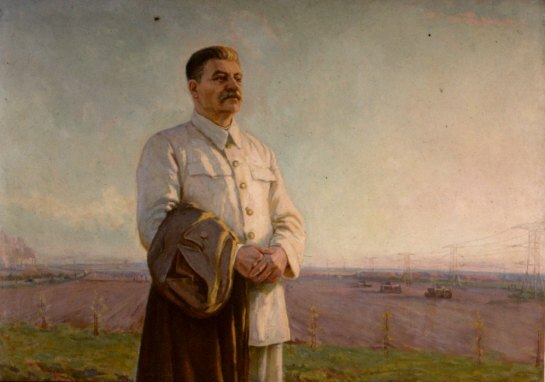 In these paintings, they place Stalin at the apex, but they leave openings. Plamper claims that the railing in Stalin and Voroshilov is broken in order to make the people on the far embankment visible and therefore within Stalin’s circle, but closer inspection reveals that even if the railing had been unbroken there, the people would have been visible. Triangles and unclosed diagonals divide space dynamically but they are also incomplete. I’m not suggesting that Gerasimov and Shurpin were closet dissidents, inserting exclusion and openness into the totalizing visual ideology of Stalinist painting. I am saying that something else is going on in these two iconic paintings that invites recognition if they are to be understood as icons of the Stalin cult; that they are far more complex than Plamper admits; and that visual images function in more difficult, slippery, and interesting ways than these interpretations allow. In her book, How the Soviet Man was Unmade (Pittsburgh, 2008), Lilya Kaganovsky has argued persuasively that injured, wounded, weakened men were as essential to the establishment of Stalin’s superior authority, as the perfect, Stakhanovite, physical specimens we usually associate with the ideologically prescribed achievements of Stalinist rule. Perhaps in this case, Stalin’s massive stability is more persuasively conveyed when it is composed of both open and closed signifiers, or when the idea of totalizing inclusiveness is represented by visual dynamism, broken open wedges. I don’t know if that’s the exact process at work here, but visual theory of almost every stripe has shown that images work on us in subtle, non-verbal, subconscious ways, no matter how simple or straightforward the surface narrative or ideological purpose. More could be said along these lines, bringing the semiotic and art historical literature to bear on Plamper’s reading of the gaze, landscape, portraiture, address to the viewer, and so on, to show that even such deceptively simple paintings demand more accurate and complex readings to appreciate them as visual documents, functioning in a visual, transmedial cultural context. This leads to the second point I want to make about The Stalin Cult: its ambiguous interpretation of Socialist Realism in painting. Plamper defines Socialist Realism in a fairly conventional way in his discussion of Gerasimov’s Stalin and Voroshilov in the Kremlin when he juxtaposes the “Romantic myth of autonomous artistic inspiration” to Soviet artistic practice, “where art was created according to plan, copied, and mass-produced.” (103) Yet the abundant and illuminating evidence he collects about the artists and institutions that produced the works of the Stalin cult challenge that very definition. The second half of the book describes production processes that are contested, improvised and often chaotic. This evidence supports an argument that Plamper can’t quite bring himself to embrace. He quotes Boris Groys’ characterization of Socialist Realism as an “irreducible other,” (115) and relegates to a footnote one of the best studies of the practices of Socialist Realist production, Erika Wolf’s dissertation on photography and USSR in Construction. That footnote quotes Wolf as saying that “Socialist Realism took shape only through the development of a working practice and this required a period of adaptation and experimentation” (287, fn 99). Wolf’s view is precisely the way I’ve come to understand Socialist Realism as a state cultural policy through studying film production. Plamper’s description of painting contests, exhibitions, and institutional interest in comment books shows a similar dynamic. Film makers during the Stalinist period never knew if their work would be deemed acceptable until they received the final stamp of approval. At every stage—from script writing to post-production—films were subject to interpretation and discussion by committees of industry peers and by ideological authorities; and everyone knew that these interpretations ultimately could be subject to Stalin’s personal revision. Those discussions often revolved around the ways a film did or didn’t fulfill the ambiguous principles of Socialist Realism. There was never anything as clear as a “plan.” The original decree became a set of vague guidelines that required constant interpretation and application. Those discussions and decisions, along with artists’ “adaptation and experimentation” are what defined Socialist Realism at any given moment. Interpretations and decisions could be unpredictable, but I don’t see them as something magical or irreducibly opaque. Socialist Realism was a “closed” system in the sense that artists did not have the autonomy to choose their topics or modes of representation, but artists, even the most ideologically orthodox artists doing the most politically sensitive work, were always able to find some room for individual creativity because the system did not fix all its parameters in advance. And because they were artists, most of them seized on what autonomy they could. Even Plamper’s painters, whose subject placed them under the most pressure to conform, were subject to these uncertainties and opportunities. In this reading, even if Gerasimov and Shurpin and all the painters of the Stalin cult were trying to make simple, easily read images, their paintings were open to multiple, unpredictable readings, which made them hard for institutional authorities to tame. This unpredictability was also an essential component of the process that became Soviet Socialist Realism. 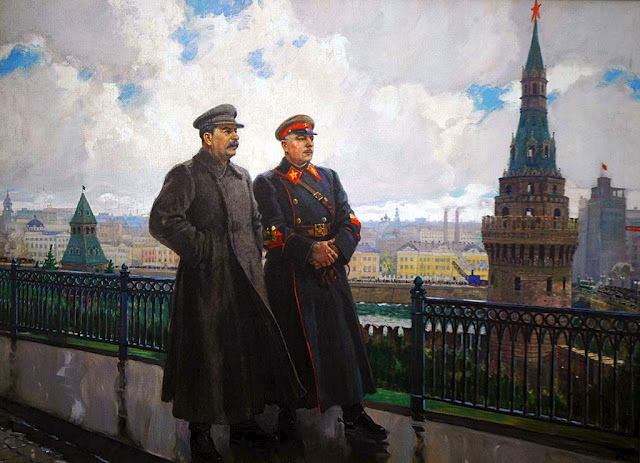 This entry was posted in Russian and Soviet Art, Stalinism, The Stalin Cult and tagged "Socialist Realism", painting. Bookmark the permalink.